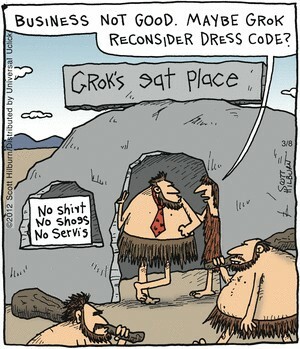 This is from The Argyle Sweater, from March 8, 2012. It’s too bad that stupid signs like this don’t affect restaurants’ business these days. So, how hot can you stand when you go barefoot? How about 180°F? Neither can I. But if our feet had developed a “Seri Boot” we might be able to. One thing that I liked when I hiked along Huber Wash in Zion National Park was the chance to see a whole new set (to me) of plants. The flora was just so different from what I was used to. And the yucca was one of those. Walking barefoot has quite often been seen as a prerequisite to walking on holy ground. We see that during the second congress of the Niagara Movement at Harpers Ferry in 1906. Yesterday evening there was a fine celebration in Newark, home of the Newark Earthworks, the remaining portion of a 2000-year old mound complex. The occasion was a visit by members of the Eastern Shawnee Tribe of Oklahoma. Yesterday was widely touted as the “First Day of Summer”. How about a barefoot-related comic strip today? This is from “Close to Home” for May 7.